VIENTIANE, 29 October 2018 - A joint meeting between the Government of the Lao People’s Democratic Republic (LAO PDR) and the World Health Organization (WHO) promoted improved coordination and training of national Emergency Medical Teams (EMTs) deployed to disasters, outbreaks, and other emergencies in the country. The Vice Minister of Health of Laos PDR, Dr Phouthone Muongpak, opened the meeting, which took place on Monday, 29 October 2018, at the Crowne Plaza Vientiane. Emergencies can happen anywhere and at any time. This year, Lao PDR experienced heavy flooding that affected many provinces, particularly Attapeu. The event caused loss of life and extensive damage to property. It also affected people and their well-being. The Lao Government, with its National Disaster Management Office, took the lead in conducting the rapid response. The Ministry of Health activated the Emergency Operations Center (EOC) to coordinate with and provide guidance to local health authorities for an effective and timely response. Acting WHO Representative to Laos PDR, Dr Momoe Takeuchi, agreed with the Vice Minister of Health. “Deployment of EMTs involves many sectors and players, including different ministries and government institutions, at central, provincial, district and community levels. A system or mechanism should be available to ensure smooth coordination among these institutions,” she added. Countries conduct emergency medical responses in different ways and with different capacities. 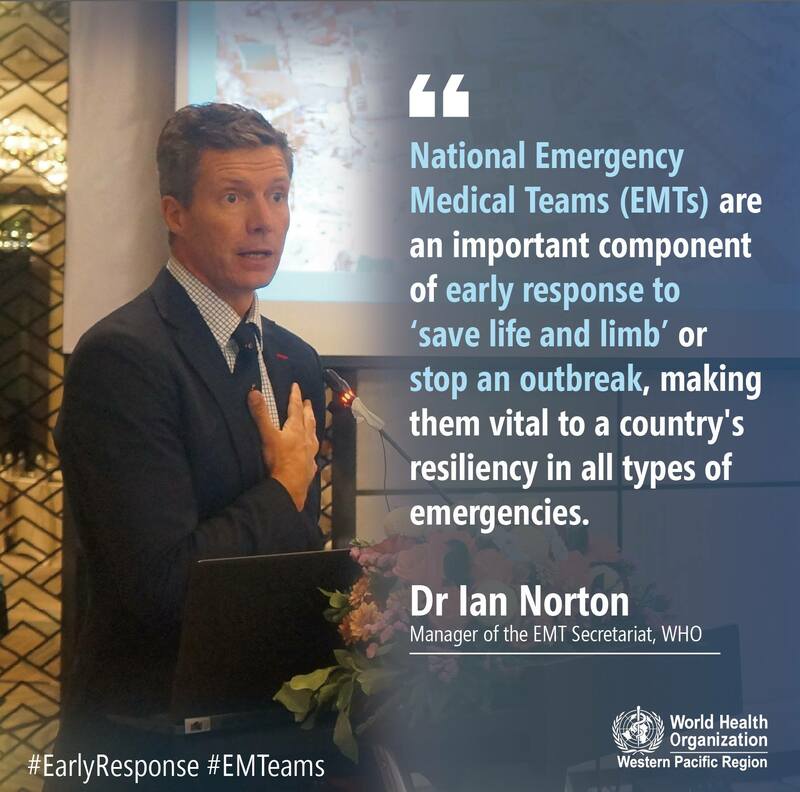 The WHO EMT Initiative ensures rapid deployment of quality-assured medical personnel that match the needs and situations in the field, with sufficient capacity, equipment and supplies. The host government also needs to have the capacity to integrate EMTs into the local health system in order to allow immediate response. The orientation meeting on EMTs focused on discussions between different ministries and government institutions from central and provincial levels, with the goal of strengthening the country’s coordination in managing EMTs for future outbreaks or disasters.